The first section of the paper provides an assessment of the current state of the ‘peace’ process: Political and security-related developments of the past years are analyzed with a special focus on continuities and changes of politico-economic structures and networks of its former war economy. This analysis provides the framework for two case studies that focus on the developments in two cities and their surroundings in North and South Kivu, Goma and Bukavu. 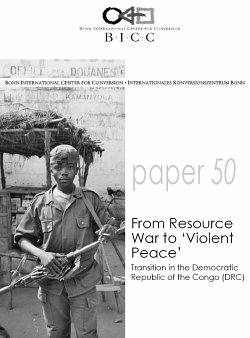 The case studies give a more in-depth-analysis of the political and economic structures in these regions during and after the war and evaluate the role of important military, political and economic actors—both Congolese and foreign—in the transition process. In this section, the study combines findings from deskbased research and findings the authors gathered on a field trip to the DRC in June 2005. The outcome of the study underlines the fragility of the peace process. Despite some changes of the economic and political structures former war elites—military, political and economic—still remain influential. They defend their positions and benefits of the war era and try to ‘transfer’ them to the changed situation. In addition, various actors still possess a spoiling potential.